As Frank levels up in Dead Rising, he'll learn new moves to help dispatch the zombie hordes. The order in which he learns them is not necessarily the order they appear in this list; to a certain extent, they're learned at random. This skill allows you to kick during jumps. It is useful in clearing a path through crowds of zombies. This skill allows you to climb on unsuspecting zombies. You can even walk along the top of zombie crowds. Press while pushing toward nearby standing zombies. Skill used for evading zombies. 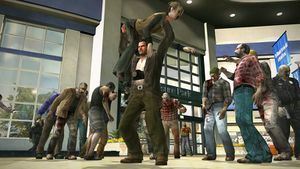 When grabbed by a zombie, repeatedly push in the direction Frank is facing to deliver a kick to the attacker. Push in the same direction twice in rapid succession to throw yourself in that direction. You are invincible at the beginning of this move, but the end will leave you open for a moment. Avoid Zombie attacks with this skill. When grabbed by a zombie, repeatedly push or to repel the attacker and escape danger. Make use of Frank's burly physique with this fierce tackle skill. This powerful skill calls on the art of Judo and takes out a zombie with style. When grabbed by a zombie, push away from the attacker repeatedly to toss them over your shoulder. You will score a 100 PP bonus for each zombie killed with this skill. Utilize Frank's upper body strength by extending both arms and spinning in place rapidly to knock down surrounding enemies with this skill. Frank will lose his grip on any equipped weapon or item as the Double Lariat is finishing, so it's best to have your hands empty while performing it. Press while clicking . You will score a 50 PP bonus for each zombie killed with this skill. Unleash a powerful kick just as you land with this skill. Press at the exact moment you contact the ground following a jump or drop from a higher plane. You will score a 100 PP bonus for each zombie killed with this skill. If you hold down on the while landing and then press , you'll do a sweep kick, giving a 300 PP bonus for each zombie you kill. Lift a zombie and give them a toss with this skill. While facing a zombie, simultaneously press and without pushing . Then, press again to throw the zombie forward. You will score a 10 PP bonus for each zombie killed with this skill. Make zombies eat dirt by bringing your knee crashing down on them with incredible force. During a jump, press while pushing . You can also use this skill to survive a high fall. Grab your opponent and send them flying. Facing a standing enemy's back, simultaneously press and without pushing . Use your momentum from kicking off a wall to deliver a punishing kick to zombies with this skill. Press while pushing in the opposite direction of the wall at the moment you make contact with it. This skill allows you to grab a zombie and give them a good shove. Press and simultaneously while standing at a zombie's side. Choose a direction to push with and shove using . This skill allows you to grab a zombie's head and give it a brutal twist. Stand near the head of a fallen zombie and press and simultaneously. Grab a zombie by its rotten ankles and take it for a spin with this over the top skill. Stand near a fallen zombie's feet and press and simultaneously. This skill allows you to grab a zombie by the scruf of the neck and smash its face into the ground. Press and simultaneously while pushing toward a zombie from behind. You will score a 300 PP bonus for each zombie killed with this skill. This skill allows you to quickly thrust a hand inside a zombie's body and yank out their putrid organs. Push toward a zombie from the front while simultaneously pressing and . This skill allows you to unleash a kick so powerful that it can decapitate a zombie in one hit. Press to jump, then immediately press . A properly trained fist is more powerful than any blade. This incredible skill demonstrates the ancient art of karate at its most brutal. Press to unleash the attack on zombies behind Frank. Only those who have observed and mastered the art of zombie movement can utilize this skill. Blend in with the crowd with the ultimate deception and keep their attacks at bay. This page was last edited on 20 December 2013, at 00:49.